Which VIP package is for you? 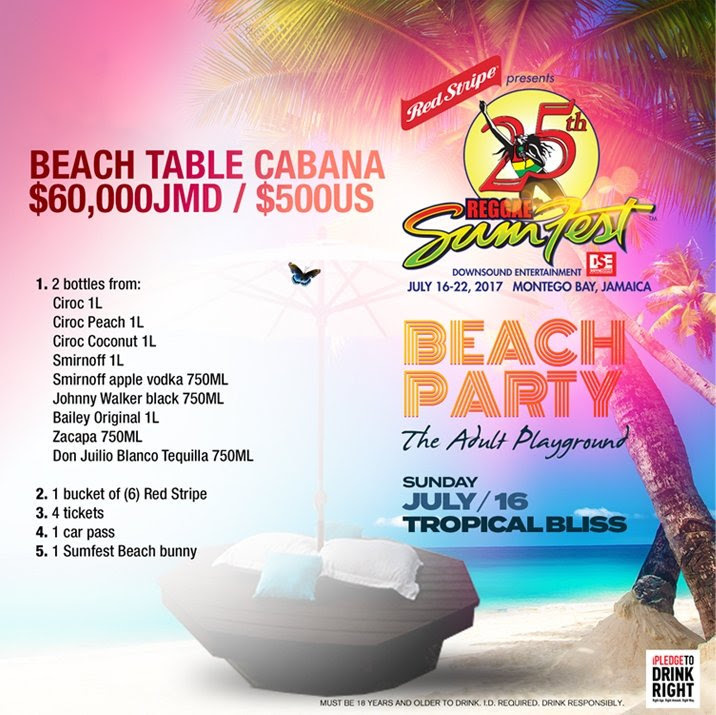 ULTRA VIP OFFERINGS FOR THE REGGAE SUMFEST BEACH PARTY CONSIST OF: BEACH TABLE CABANA & BEACH BED CABANA PACKAGES, COMPLETE WITH A BEACH BUNNY SERVER. Reggae Sumfest is offering on Friday and Saturday nights, a 10 x 20 Cabanas for 10, & 10 x 10 Cabanas for 6, and Bottle Service Lounges for 6. 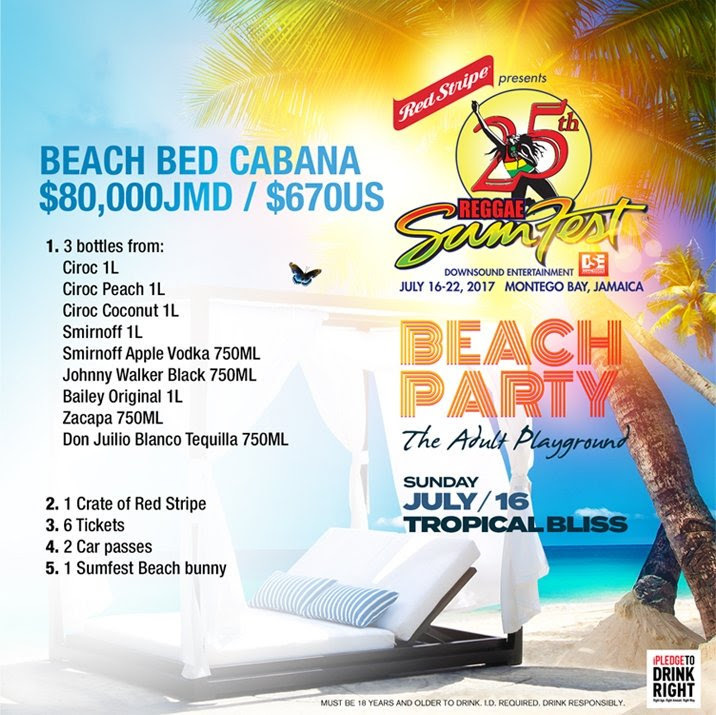 In addition to these Cabana offerings, Sumfest is also offering single seats on this Ultra VIP platform for only $100 each and the customer gets two Red Stripe beers! VIP Seating is limited so reserve yours today. 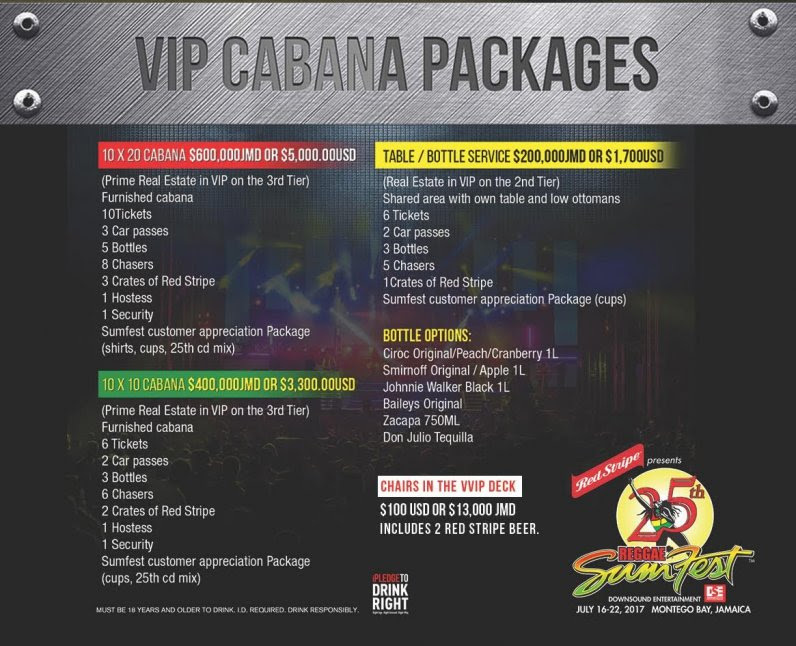 When a festival attendee buys a Cabana or a Bottle Service Lounge ticket, they will be contacted by a Sumfest concierge representative details on their choice of beverages and instructions on how to pick up their packages of tickets, wristbands, parking passes, and Sumfest swag. Individual Seat purchasers can go straight to the festival with their ticket to get wristband and drink tickets. Thursday, July 21 11:00 a.m. – 6:00 p.m.
Friday, July 22 11:00 a.m. – 6: 00 p.m.
Saturday, July 23 1:00 p.m – 4:00 p.m.
With a line-up featuring many of Reggae's biggest stars, it's no wonder that Reggae and Dancehall lovers from around the world are making the Sumfest Week their summer vacation! The 2017 ReggaeSumfest Festival presented by RedStripe in Montego Bay on July 16-22, 2017 is going all-out in celebrating this 25th Anniversary. Sunday July 16 - At postcard-perfect Tropical Bliss Beach with a wet, wild, and risqué Beach Party, The Adult Playground, complete with Beach Bunnies offering beverage service, swim-up ocean bars, wild rides and games, and more surprises. Monday July 17 - 500 lucky fans board the Treasure Queen yacht in beautiful Montego Bay for a four-hour Party Cruise, followed up by a late-night after-party at Pier 1 Bar & Restaurant on the Bay. Tuesday July 18 - The always-packed All White Party at Pier 1 with everyone dancing and romancing in their finest and sexiest whites. Wednesday July 19 - The Blitz: Retro Block Party; everyone comes in outrageous 90’s Dancehall Costumes and hears the best of Jamaica’s signature Dancehall beats that changed global pop and urban music forever, and celebrates the evolution of Dancehall Music in the wild 90’s. Thursday July 20 - Heavyweight Sound Clash will feature a lineup of International Sound Systems battling for prizes, with guest appearances by legendary Sound Systems from all over the world. Main Events – Friday & Saturday, July 21 & 22 The Catherine Hall Event Center, located right on the Bay, hosts the all-night-long lineups of the Greatest Jamaican Dancehall & Reggae Stars in the World including Alkaline, Mavado, Sean Paul, Sizzla, Bounty Killer, Beenie Man, Queen Ifrica, and many, many more!